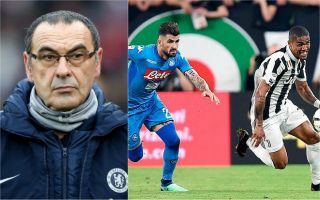 Chelsea manager Maurizio Sarri has reportedly asked his board to deliver the transfer of Napoli defender Elseid Hysaj as two players look set for the Stamford Bridge exit door. The Daily Mirror claim Hysaj is now a loan target for the Blues, with Victor Moses and Davide Zappacosta looking set to leave the club this January. Hysaj is a reliable and proven right-back who has shone in Serie A, impressing for Sarri at two of his former clubs – Napoli and Empoli. The 24-year-old is ideally being lined up for a loan to Chelsea, though they may have to pay as much as £45million for the Albania international as Napoli would rather sell him permanently, according to the Mirror. Chelsea started brightly under Sarri before a recent slump, so it’s little surprise the Italian tactician appears keen to make a number of changes to the squad at Stamford Bridge. The 60-year-old raided his old club Napoli for Jorginho in the summer, and is also set to be reunited with another of his former stars in Gonzalo Higuain, according to Calciomercato and others.